The research, led by the University of Southampton and UCL, which took place on Mount Everest, assessed the mechanisms by which low oxygen levels in the body – known as hypoxia – are associated with the development of insulin resistance. Insulin resistance is when cells fail to respond to insulin in the body. Insulin enables the body to regulate sugar levels. Too much sugar can be toxic and leads to type II diabetes. The research, published in PLOS ONE, found that several markers of insulin resistance were increased following sustained exposure (6-8 weeks) to hypoxia at high altitude and that this change was related to increased blood levels of markers of inflammation and oxidative stress. The data came from a study called Caudwell Xtreme Everest, which took place in 2007 and was coordinated by the UCL Centre for Altitude, Space and Extreme environment medicine (CASE Medicine). During the study, 24 people travelled to Mount Everest and underwent assessments of glucose control, body weight changes and inflammation biomarkers at Everest Base Camp, which is at an altitude of 5,300m. Half the group remained at Base Camp while the other half climbed the mountain to a maximum of 8,848m. Measurements were taken in each group at week six and week eight of the trek. The aim was to increase understanding of critically ill patients. The team also made the first ever measurement of the level of oxygen in human blood at 8400m, on the balcony of Everest. 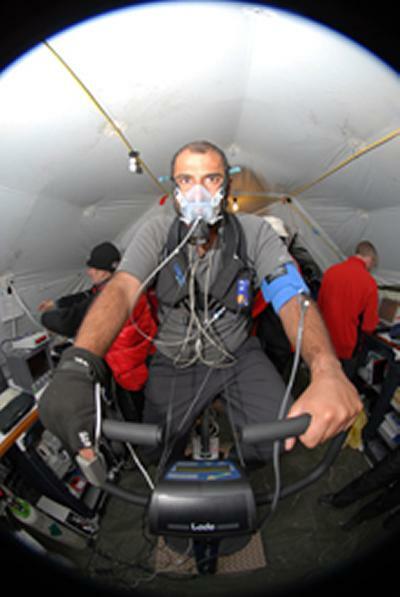 This is the centrepiece of an extensive and continuing programme of research into hypoxia and human performance at extreme altitude, aimed at improving the care of the critically ill and other patients where hypoxia is a fundamental problem. The most recent experiment by the same team, Xtreme Everest 2, took place in spring 2013.